The Good. The Hard. The Hopeful. This past year was full of growth, new births, challenges, and all that comes with a house full of new mothers and babies. 2017 was the first year of Emma House being able to provide a home for eight women and their babies at a time. "Susan" was married with two beautiful children. In their home, addiction caused havoc and stress in the marriage and with the children. With the family breaking apart, Susan's husband was able to get his addiction under control. However, Susan's addiction was spiralling her down and she ended up homeless and without her family. She became pregnant with another addict's baby and in her desperation, she checked herself into detox and then into a recovery program. Susan then moved into Emma House when she was seven months pregnant. During her time at Emma House, she was able to begin communicating with her husband again and have supervised visits with her two children. husband was with her when her baby boy was born. Through the following months, the relationship was beginning to heal. When Susan's baby boy was five months old, they moved out of Emma House and back with their family. A family was restored! Domestic Violence contributes to the vulnerabilities of our pregnant mothers. In Canada, 25% of homeless women cite domestic abuse as a factor leading to their housing loss. Additional challenges like being an immigrant or refugee multiplies their vulnerability. Over half of the residents currently at Emma House have experienced domestic violence, which includes physical and emotional abuse. "Amanda" came to Canada with some family members from a refugee camp in Africa. She was abused by her father and other men that were invited into the home. Other female family members emotionally assaulted her and shamed her. She ran away from home and was in and out of group homes. Because of the trauma that she has endured, she shuts down from emotional connections. She came to Emma House pregnant and staff worked to rebuild her self esteem and confidence. When she gave birth to a baby girl, the CFS was worried that she would not be able to bond with her baby and respond to her needs. However, we saw a miracle and Amanda is connecting well with her baby, who will be 5 months old this month. Because of faithful donors and volunteers, we have been able to house 20 pregnant women and see 11 babies born in 2017. The challenges are immense. However, we are hopeful because we have seen women overcome them when they are surrounded with by people who love them and advocate for them. The new year will be full of hope at Emma House because of you. Hello, December: The Season of Giving & Growing! The end of the calendar year marks the season of giving and compassion for many people. Throughout the year, and in particular in the past week, Emma House has been a beneficiary of that compassion! To kick off the Holiday Season, the Student Council at Ambrose University generously hosted a Christmas Banquet in honour of the past and current women at Emma House. The occasion allowed hard working moms the chance to be pampered and celebrated for their strength and commitment to being their best. In the midst of the holiday celebration, mothers, children, staff, and volunteers were reminded of the strength of community and were gifted with a renewed sense of belief and faith. 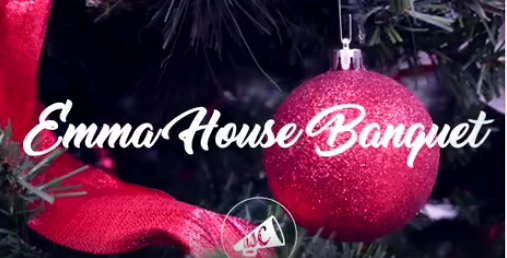 Click here to view a video from the Ambrose University Student Council Christmas Banquet. Days later was officially #GivingTuesday in Canada. Emma House was able to spread awareness of the services we provide and raise valuable funds to help us get through the New Year! While we are so grateful for the financial donations we received, we sincerely understand that generosity does not start and end at a financial contribution. In a season that promotes generosity, we have to spotlight the people who generously give of their time, heart, and skills throughout the year. #GivingTuesday brought heightened interest and awareness to our organization, and several individuals stepped up to offer unique services to our residents. Thank you to all who participated in the act of GIVING to Emma House, not only on GivingTuesday, but everyday throughout this year! Emma House has already been blessed this Holiday Season, and we hope you’ll continue to give. Remember that in giving, WE will grow. Emma House will be able to further cultivate a safe home- a place for vulnerability, growth, and relationship, that is centred around love and encouragement. But also remember that in giving, YOU will grow. You will connect to others in important ways, and understand what it is to be part of a community that needs you. Happy Holidays, everyone! May you and your loved ones continue to come together in the spirit of giving and growing. Know deep in your hearts that you are making a difference! Next week Emma House sadly says goodbye to a dedicated staff member and inspiring young woman. In order to pursue her Masters Degree in Counseling Psychology, our Outreach Coordinator is parting ways with Emma House. Before she goes, she’s reflected on her journey as a staff member, and shared what she’ll remember most about the women she met through Emma House. We wish her all the best in her future endeavors, and will never forget the impact she had on the lives of women and babies in need. It was eight o’clock on a Sunday night, and I found myself sitting in a car next to a hysterical, pregnant, fifteen-year-old girl crouched over in the passenger’s seat sobbing uncontrollably. We were stationed outside her father’s house, which had just been raided by the police after the neighbors saw a man dragging a woman across the floor onto the front steps of the house. Inside the residence the police had found a myriad of drugs, alcohol, and tobacco. After investigating the situation, the officer on duty stated that the house was not a safe place to live in and suggested that the young girl find a shelter to stay. As I sat in the car, reflecting on the past few months that this girl had spent at Emma House and the definitive decision she had made to go back to her old lifestyle, I began to genuinely question my ability to help and enable a long-lasting impact in her life and the lives of the women I encountered daily. It was stories like this one that opened my eyes to the dangers and obstacles of being homeless and pregnant. Over the past two years, my time at Emma House has been filled with a range of various emotions. I have had the privilege of embarking on a journey with twenty seven different women from various cultures, families, and circumstances; each with their own life stories. As each of these women entered Emma House with the purpose of finding healing and making a change, I realized I was part of an organization that was focused on equipping women--who were once lost and broken--and leading them into a life of wholeness. In many aspects, Emma House is like a glass mosaic with each woman as a different piece of the puzzle. Each piece essential to the final product; alone, the picture wouldn’t be complete, but together they make up the body, the community, the family that is Emma House. It is difficult to understand how such a vulnerable demographic could be looked down upon for their life choices and circumstances when in reality these women are some of the most persistent, resourceful, and resilient people I have ever met. Though not all of them succeed in making a change, the ones that do have overcome adversities and built a better life for themselves and their children. As I’ve watched these women become bold, empowered, and independent, I am truly honored to have been a part of such a monumental period in their lives. So, as my time at Emma House comes to a close, I leave learning…knowing…believing that these women are not accidents waiting to happen, but destines being fulfilled. Our clients aren't usually what you picture when you hear the word "homeless". Many are the "hidden homeless", which refers to living temporarily with others but without guarantee of continued residency or immediate prospects for accessing permanent housing. Often it is known as "couch surfing". They stay with relatives, friends, neighbours or strangers because they have no other option; increasing their vulnerability. Because of your continued support, we are able to provide mothers with immediate safe housing and help them make a plan for a secure future. Our goal, with your help, is to stop the cycle of poverty in their child's life. Did you know Emma House is a program and not an emergency shelter? For many new arrivals, Emma House offers the first loving, disciplined environment they have ever experienced. Guidelines for all residents include daily chores, curfews, attending school, going to a job each day, or regular volunteer work. These guidelines provide consistent structure for the women as their delivery dates approach. As the winter months surround us, please keep our mothers and babies in your hearts. Freezing temperatures, icy roads, and heavy snowfalls cause increased expenses to keep our home warm and our mothers and babies safe. Please consider donating this winter to help us continue to empower our moms and get our little ones through their first snowy winter. To become a monthly donor, sign up by clicking here. THANK YOU FOR YOUR SUPPORT THIS WINTER SEASON! Each and every day, the moms at Emma House are working hard to create a healthy life and family for their babies, when many have never experienced that for themselves. Imagine the fear of being pregnant and alone, with the thought that you may have to give birth on the streets or in a shelter. Imagine not knowing where you will live or how you will provide a safe place to raise your child. Emma House is here to help provide vulnerable mothers and babies with the safe shelter they need to succeed. While we have the ability to provide eight beds for vulnerable women, there are still less than twenty beds in total available for pregnant, homeless women in Calgary. Due to this, we are more often reaching full capacity, leaving us financially stretched and in dire need of donors and volunteers to support our guests. The need to expand is critical. How could I know what a family was when I didn't have one?" This October Emma House is assisting five mothers along with their babies, and three pregnant mothers. Support for these women costs us $25,000 each month to provide shelter and 24/7 care and support. Local need for our services is only growing. We are in a time of need and your financial gift would truly make a difference. You can give a one-time gift or sign up for monthly contributions by visiting our DONATE page. Your donation will dramatically improve the outlook for each mother and child at Emma House and directly impact the quality of their life. You have the opportunity to help local families thrive by reaching out now to volunteer at Emma House. Day and Night shifts are available to be part of the community at the house, providing supervision, friendship, and baby cuddle time. If you can be available ONE DAY or NIGHT a month, please email info@emmahouse.ca today! On November 3, 2016, Emma House held their first fundraiser! We are so thankful for everyone who came to support Emma House, who learned, celebrated, and gave. Thank you to our sponsors; Raya De Sol Photography, Rock Pointe Church, The Local Booth, The Local DJ, and many more individuals.